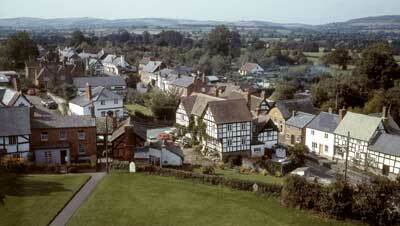 Pembridge, The Jewel in the Crown of north Herefordshire’s Black and White Village Trail. One of Britain’s finest Mediaeval Boroughs, nestling in the rolling north Herefordshire Countryside. Occupied since before Magna Carta, every street contains mediaeval buildings which, in any other location, would be individual attractions in themselves. Pembridge is the quintessentially English Village that has thrived for the last thousand years. Mentioned in the Doomsday Book, Pembridge was a bustling community of over 2,000 people in the Middle Ages and, although the population is less than half of that now, it’s popularity continues to grow. Pembridge reached its zenith as a busy market town during the mediaeval period when it was renowned for its lively and undoubtedly profitable fairs. Despite suffering the vagaries of wars, economic decline and the relentless march of progress, Pembridge has retained not only its colourful historic mantle of ancient attractive buildings but also its ‘die hard’ community spirit which is reflected in its current place as a jewel in the crown of the Black and White Village Trail. This website aims to give visitors and locals information about the village, local events and groups. If you have anything you would like added to the site please contact us with the details. In the Church of St Mary’s there are some wonderful stone effigies. 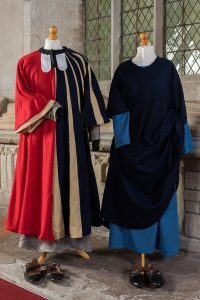 A chance meeting in 2015 with author and costumes expert Sarah Thursfield led to the creation of replica costumes. 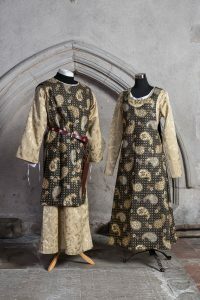 Following this a project was carried out to recreate the wedding outfits from a 1301 wedding in Pembridge. For more information please click on the images below, or visit St Mary’s Church, Pembridge.